Home / Automobiles / Business and Marketing / product or service reviews / Skoda/Audi's Buy Now, Pay in 2020 EMI Holiday scheme explained! Skoda/Audi's Buy Now, Pay in 2020 EMI Holiday scheme explained! Remember the Skoda ad in which the guy who goes out to buy some fruits returns home with a Skoda rapid (and still manages to buy fruits as well)? This was thanks to Skoda's scheme of Buy in now (2018/2019) and pay in 2020. I couldn't check out the details last year (Skoda have only 1 showroom for whole of Chennai- even Mercedes has more showrooms). This year the offer is back, on all Skoda cars, including Rapid, Octavia and Superb. So I decided to check out. I was super excited at the prospect of stepping out of my home with just about Rs 150 (to buy some fruits) and drive home in a new Skoda car, without having to worry about the money for an year! Below is my experience at the Skoda showroom. The conversation has been edited for dramatization purposes. Location: Gurudev Motors, Skoda Showroom, Anna Salai, Chennai. Me: Thanks. I am looking to drive home in a Skoda car now and pay next year! Me: No- I will take whichever one readily available to be driven home. The Salesman: There're some formalities sir. Me: Fine, as long as it can be completed before showroom closes. I have Rs 150 in my pocket- I can afford to spend Rs 50 as I still need to buy some fruits- which are very expensive these days. The salesman: It doesn't work that way sir! Me: (Genuinely surprised): Then how does it work? The salesman: You need to apply for loan, once approved you need to pay 35% down payment and rest you can pay from 2020 onwards! Me: I have enough money to buy some fruits- can I get the loan sanctioned right now? The salesman: No sir- you have to give your ID and address proof, income proof etc and then the bank will decide if you're eligible for a loan. Once approved you also need to pay 35% as down payment. Me: Hmm, the cheapest variant of Rapid costs 10 lakhs on road. You think the guy in the ad was carrying 3.5 lakhs when he stepped out to buy fruits (Fruits are expensive, but not really that expensive!)? Do people carry salary slip and IT returns while going to buy fruits? The salesman: I don't know sir. If you can come tomorrow bank representative will be here- you can liaison with him. Me: But how will I take the fruits home tonight- you're suggesting me to take an auto or cab now? How did the guy in ad got his loan approved so fast? So that is the end of the story for me. Where did they mention about 35% down payment in the ad? Anyway, the catch here is this-On a 10 lakh rupee car, if you're paying 3.5 lakh upfront, the loan you're asking is technically for 6.5 lakhs. The EMI you might have paid over 5 years is apportioned to last 4 years. Instead of paying Rs 16000 for 5 years (60 months), you will pay Rs 20000 for 48 months (year 2-5), first year declared as EMI holiday. There will be a processing fee of Rs 5-6k. All these cleverly packaged to suggest that no need to pay anything in first year! Skoda Rapid on road price in Chennai varies from 9.9 lakhs to 14.2 lakhs for petrol and from 11.3 to 15.7 lakhs for diesel. Maintenance packages, Drive assure elite and accessories extra. Meanwhile, Tata Hexa is 15 to 21 lakhs on road approx. Good Entertaining Post ! I totally enjoyed reading the Confused inputs by the Salesperson. The catch here is that How Advertising can mislead the audience. As usual, beautifully articulated. I haven't expected such big hidden cost of 35% down payment in this AD. Cheap marketing strategy from Skoda. That's what we call as a misleading advertisement. Which you Beautifully explained sir.. Ad's are always misleading. Skoda will loose it's name if they continue these cheap tricks. 3.5 lk dp is huge for a rapid. To be frank we can file a case for misguiding the customers. Ha ha.. Most of the ads are misleading now a days. There must some control to the ads to tell the truth to customers. Super, really I imagined the scene and couldn't stop laughing,these people hiding behind ads should be brought out like this ..
great article sir you exactly showed what the salesman offfers and what we percieve it to be. very well written and beautifully articulated.i myself imagined the whole scenario and it was dammn funny..!! , u r a time saver n a good writer. Thanks for sharing. in todays time you buy anything on emi or on loan its common understanding that you have to first pay a minimum amount as down payment. yes the ad that showed more than what was needed but taking any product without paying anything is irrelevant. Down payment is mandatory. I could have paid Rs 50 or max 100 as downpayment (as I went out to buy fruits, not car) . but they wanted 3.5 lakhs! hmmm. very harsh words.. I think if all ads are brutally honest, no one will buy anything! Yes sir we agree but it shouldn't be in such a way where people will loose the trust sir. Very interesting and entertaining post. I really liked. Yes, reality is always lil different than the advertisement. But I'm sure skoda cars are really good. I am using Skoda Octavia for more than 2 years and I'm quite happy with the service of skoda dealer. None of the car makers making you full. While showing the advertisement the provide notifications that. " Terms and Conditions applied " this guy missed that. Well, terms and condition should supplement what's shown in ad, not contradict. In this case ad creates an impression- no need to pay anything for an year, while reality is you've to pay 35%... 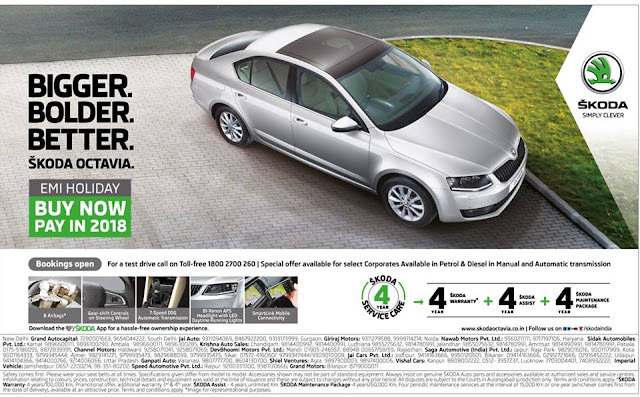 If such a practice is acceptable they can simply say "car is totally free" in the ad and include terms and condition that "free only for viewing, to drive one should pay 15 lakhs"
This has happened for me too like you really well articulated it's really a very very cheap publicity from one of the giant Co. like Skoda. Like this type of cheap add will cost the customer realiability and will loose the market. Govt should clamp down on companies that create misleading advertisement.